On Valentines Day 2015 I started my weekend adventures by going to three estate sales. The first one was a house full of dolls and china cups and plates. This was a collection of a 90-year-old lady who had gone to the nursing home. In the living room was a line of tables with all the costume jewelry and other smalls displayed. I asked the lady attending the tables if there was any Worlds Fair items. She said she didn’t think so but handed me a box of buttons/pins. I pawed through that box and found nothing of interest. Then I spotted a box of thimbles where again I found nothing. Moving along I came to her collection of spoons all loose in a box. 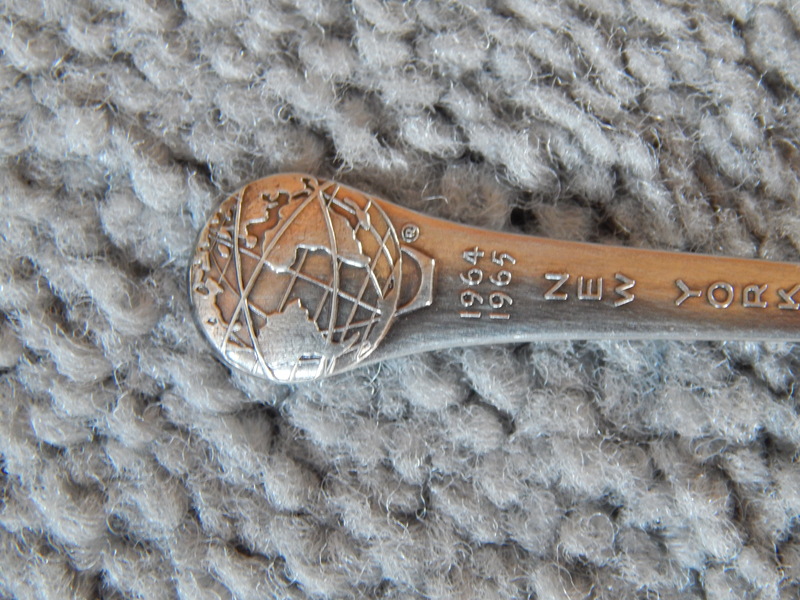 Methodically I sorted through the box, and almost the last spoon I touched is this Century 21 Exposition spoon. Joy sprung into my collectors heart. I rounded the corner of the tables and found another box with spoons. These were in their original boxes. There I put my hands on a spoon with the Unisphere on the top. That was the symbol of the 1964 New York Worlds Fair. It is one of the few fair structures that still exists today at Flushing Meadows. Picking through what American Pickers calls smalls can be time consuming but is so worth it if you find what you seek. My third prize was in a real junk box of stuff. In the past I found my first Seattle Worlds Fair Space Needle pen in one of those junk boxes. That makes me want to go to hoarder type estate sales because they have lots of unorganized debris of life. In this case this house was in great shape and had quality antiques, not the place one finds treasure that was not gleaned out by the Estate Sale Company. But that is what I was finding on this set of tables. The third item was this odd glass ashtray item with writing in the box. My instincts tell me to check out things that have writing because they are usually some sort of memorabilia. I was right and even more delighted to read Golden Gate International Exposition 1940 (San Francisco Bay) on this block of glass. It had the sculpture Pacifica which was a statue created by Ralph Stackpole for the 1939–1940 Golden Gate International Exposition held on Treasure Island in the San Francisco Bay. Stackpole’s largest sculpture, it towered 81 feet (25 m) over the entrance to the Cavalcade of the Golden West in the Court of Pacifica. She was the theme statue for the exposition, representing world peace, neighborliness, and the power of a unified Pacific coast. You ask what happened to the statue? The United States Navy purchased the island as a naval base in 1941, and Pacifica was demolished along with most other exposition structures. All this info on Pacifica is courtesy Wikipedia. Now back to this little 75 years old find. It is not an ashtray as I first thought. The lettering and embossed side of the glass block was on the top which makes me think it is a lid for some glass container. Perhaps a food container for the refrigerator or a candy dish. I did some internet searching and didn’t see anything like it. See what you think? 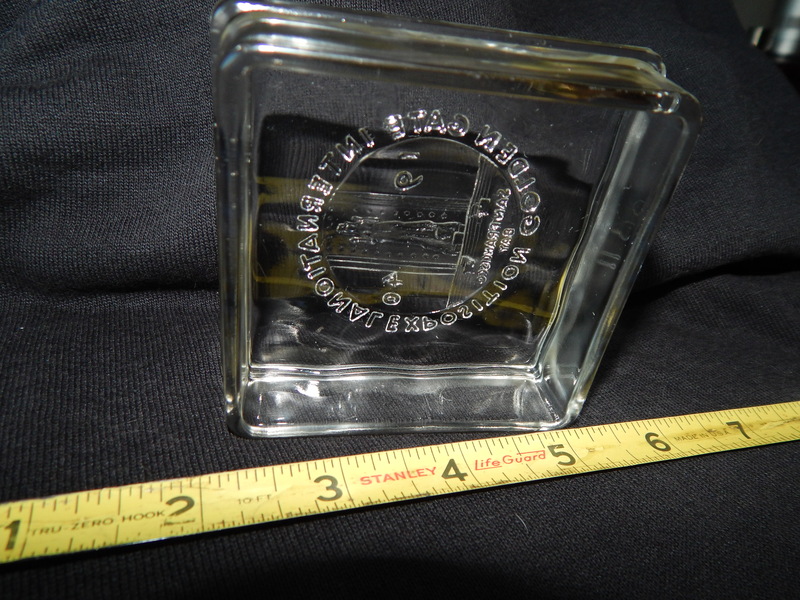 1940 Glass Lid – where is the jar or dish? When I took them to pay, she said a dollar each. I was surprised because I knew the spoons are probably worth $5 to $10 each. The glass block, well, it is only valuable to me because it is missing the rest of it. It was a great day for the Mini Museum! !